A typical dish of Neapolitan cuisine, this recipe is a great way to use your leftover pasta. 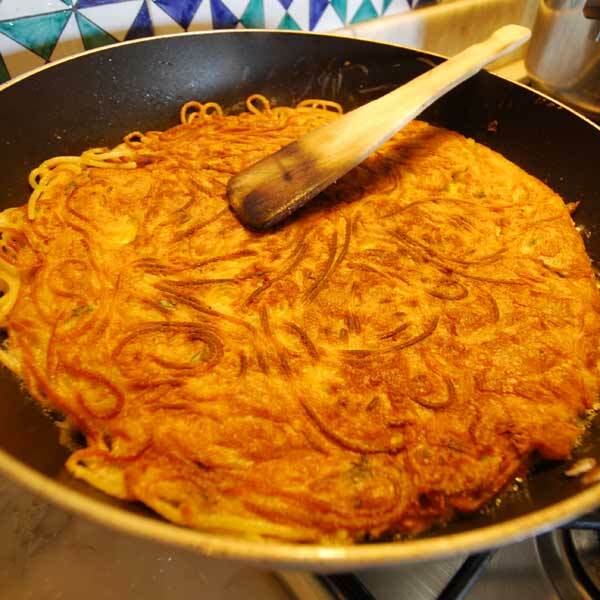 The result is a pasta frittata, or a pan-fried pasta cake that is crunchy and tasty. It’s a perfect make-ahead dish and great for a starter or a picnic, especially during the summer. Cook the spaghetti al dente in boiling water with a pinch of salt. Drain the spaghetti and mix with 1/3 of the parmigiano cheese and the butter. In a separate bowl, mix the eggs, 6 pinches of fine salt, the rest of the parmigiano cheese, basil, parsley and pepper. Once the spaghetti has cooked and cooled, add the egg mixture. Preheat the olive oil in a 10 inch pan and cook the egg and pasta mixture over medium heat. Cook the first side gently for about 20 minutes until golden brown and crunchy. Then, cook the other side by flipping the frittata with the help of a big lid. Cooking over medium heat helps create a frittata that is crisp on the outside and cooked thorough on the inside. Remove from pan and blot with paper towel when finished. Cut the frittata into squares or small pieces, just as you like. Serve at room temperature.